The world’s largest bookseller, Barnes and Noble has launched its eBook reader which called as nook. 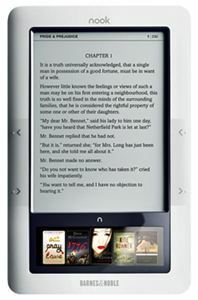 The eBook is claimed to be the first Android-based eBook reader and the first to offer a 3.5-inch color touch screen for navigation as well as with a 6-inch E Ink display for enhancing e-reading experience. To improve the connectivity between the nook and Barnes and Noble online bookstore, it has been designed to offer free 3G wireless and Wi-Fi access for Barnes & Noble in-store browsing and downloading. Furthermore, it has been incorporated with LendMe technology that allowing users lend a wide selection of eBooks to their friends for free with up to 14 days. The users just choose the book and send it to their friend’s nook, iPhone, iPod touch, selected BlackBerry and Motorola smartphones, PC or Mac with Barnes and Noble Reader software. In addition, it comes with 2GB of internal memory and supports up to 16GB of memory SD card. The nook is now available for pre-order with the price of $259 and is expected to start shipment by end of November.